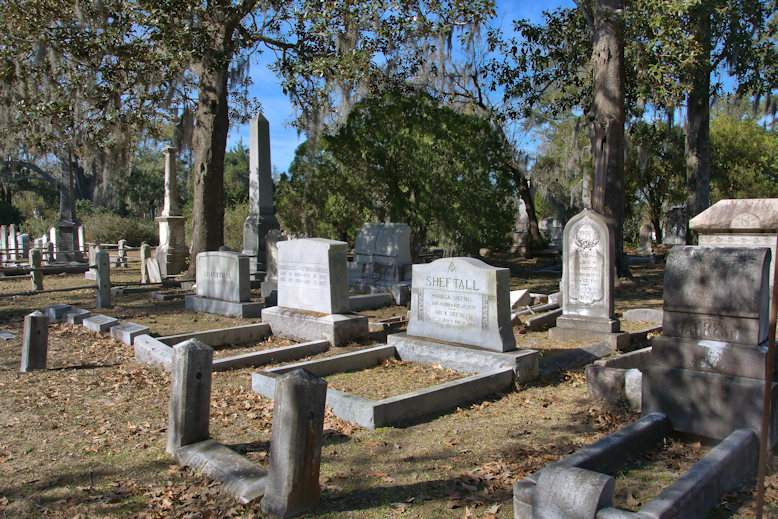 Set aside from the old Springfield Plantation lands of the Stiles family in 1850 to meet Savannah’s burgeoning need for new burial grounds, Laurel Grove* was officially dedicated by Henry Rootes Jackson at a ceremony in 1852 and opened for burials in 1853. 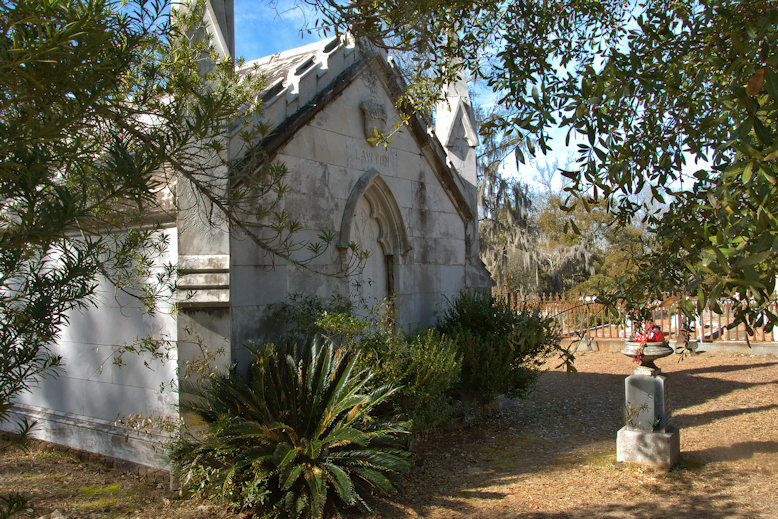 The cemetery was so popular that it was deemed “full” by the early years of the 20th century and closed to new burials. 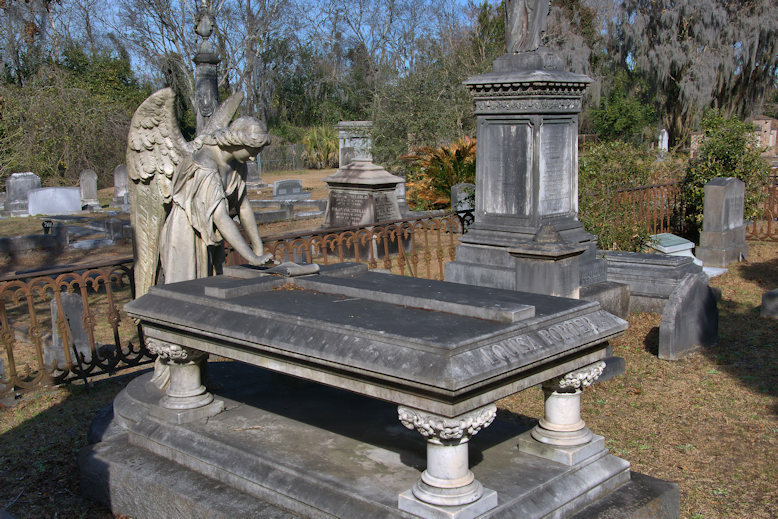 As a result, it contains one of the largest concentrations of Victorian-era funerary sculpture and ornamentation in the state. It fell into a terrible state of disrepair for decades but preservation efforts, sometimes contentious, have vastly improved its appearance in recent years. *To distinguish the white and black sections, divided by the I-16 connector, the terms North and South are used today. 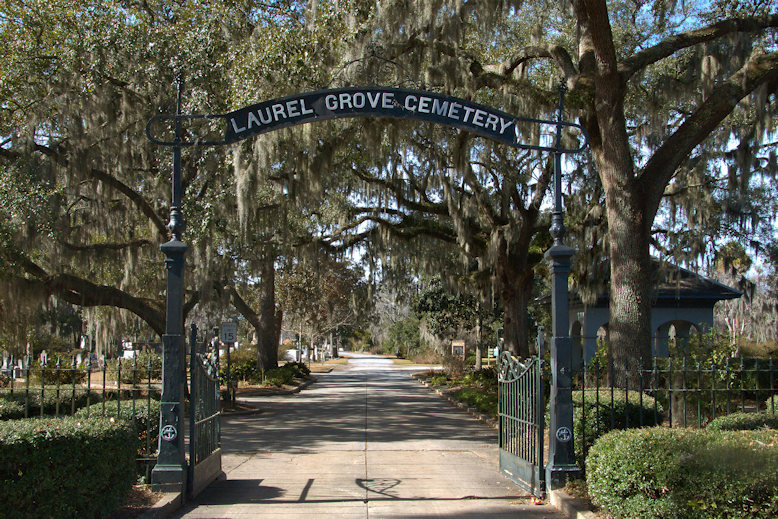 The white section is referred to as Laurel Grove North Cemetery. 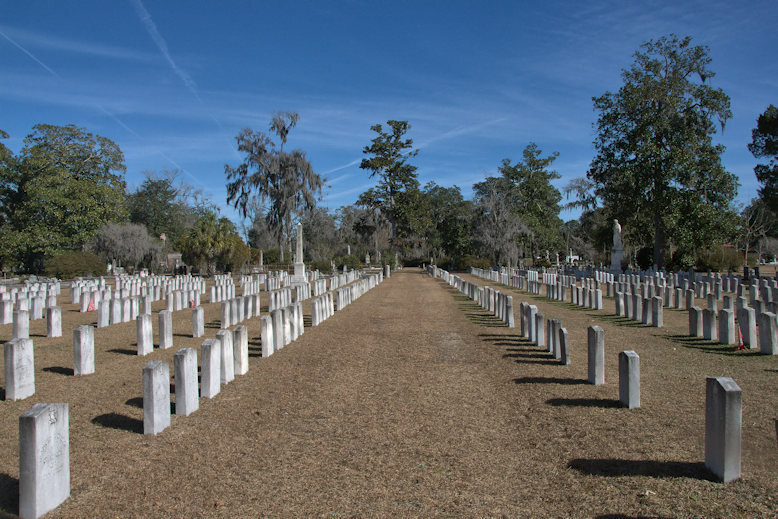 Many famous Savannahians rest here, including: Juliette Gordon Low, founder of the Girls Scouts; James Lord Pierpont, author of Jingle Bells; and famed Jewish Confederate nurse Phoebe Pember. 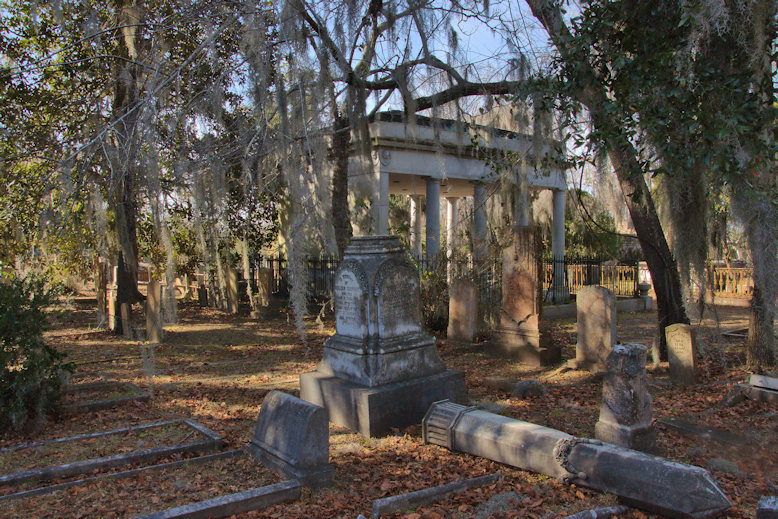 Also present are an Associate Justice of the United States Supreme Court (James Moore Wayne), cabinet members, United States Senators and Representatives, at least two dozen Savannah mayors, eight Confederate generals, a Union General, namesakes of numerous Georgia counties and towns, and a Bishhop of the Episcopal Church (Stephen Elliott) who was also the only Presiding Bishop of the Episcopal Church in the Confederate States of America. Most of these are not included in the post at the present time but will be added soon. 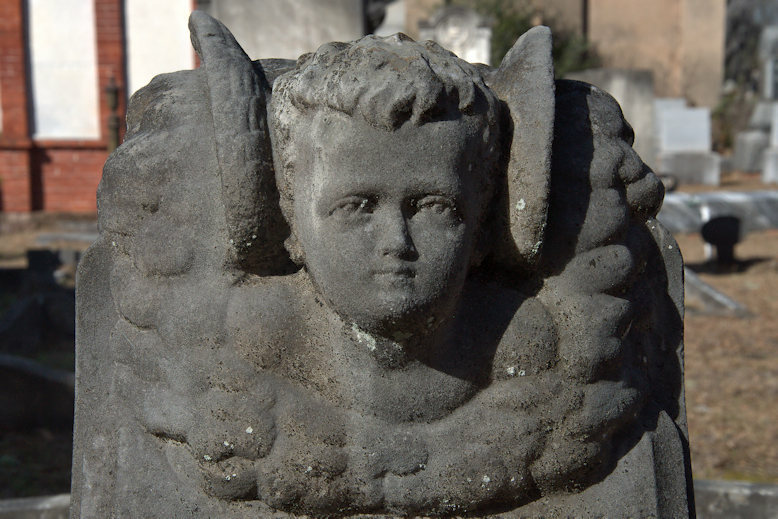 Perhaps the most-visited memorial in Laurel Grove is not of any celebrity but rather this Cararra marble angel marking the final resting place of Louisa Porter. 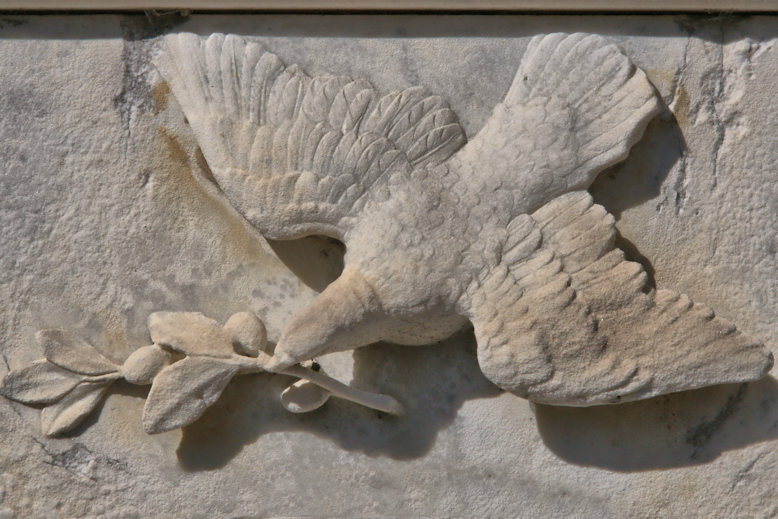 This work by Italian sculptor A. Caniparoli has drawn admirers since it was installed and continues to wow to this day. 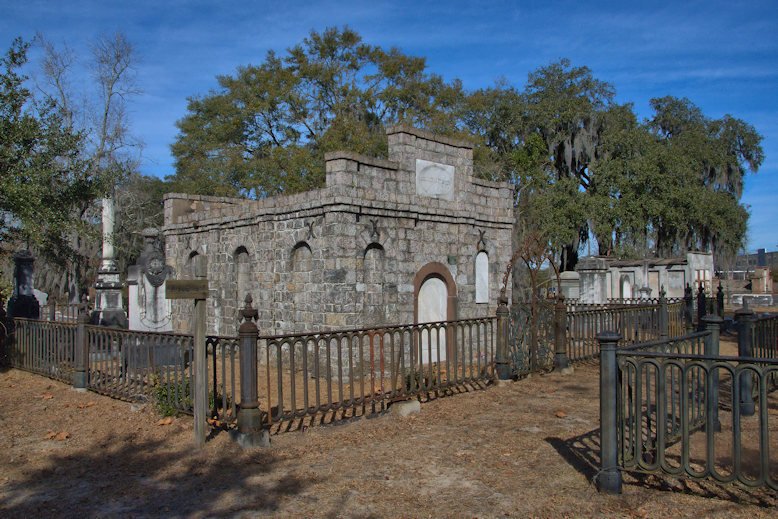 Louisa Porter’s father, Dr. Adam Alexander emigrated from Inverness, Scotland, to the United States in 1776. He served the Colonial Army as a surgeon during the Revolutionary War. Her mother, Louisa Frederika Schmidt, was German. 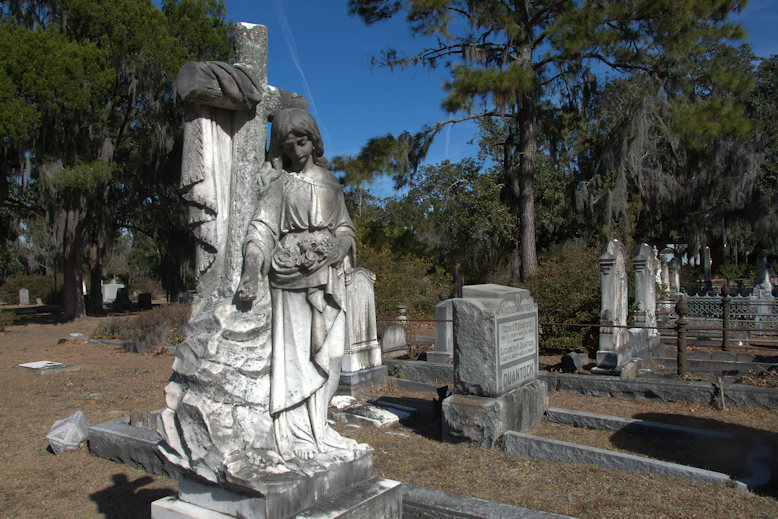 Louisa was born in Liberty County in 1807, following an older brother, Adam. 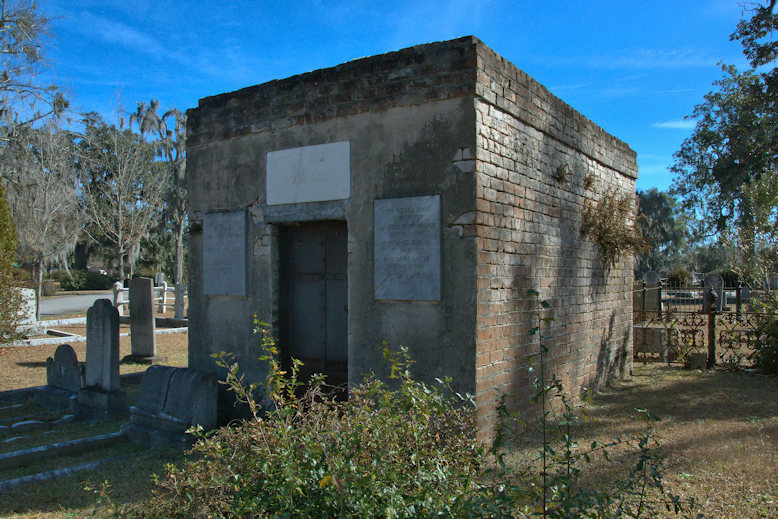 In 1824, she married Anthony Porter, president of the Bank of Georgia. Though she had no children, Louisa was quite dedicated to philanthropic efforts, especially those involving children. 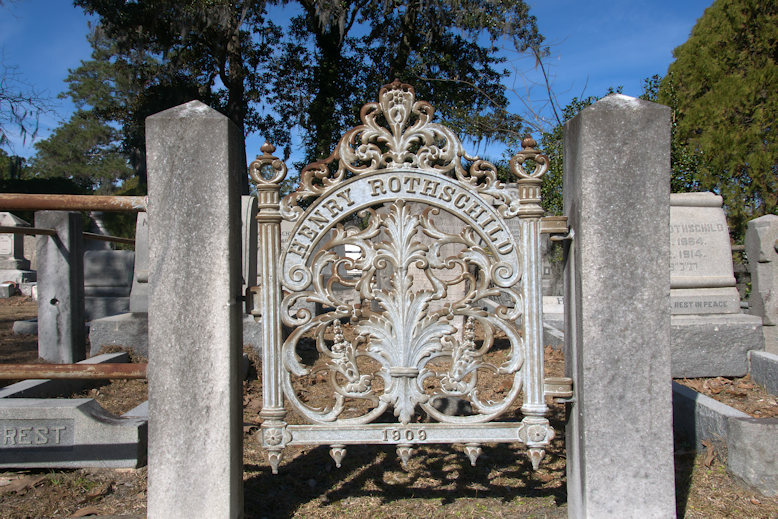 Over the years she served on the board of the Savannah Free School and as director of the Savannah Female Society. Her greatest contribution, perhaps, was her role in the creation of the Industrial Relief Society and Home for the Friendless. Upon her death, much of her wealth went to the society and its name was changed to the Louisa Porter Home for Girls. 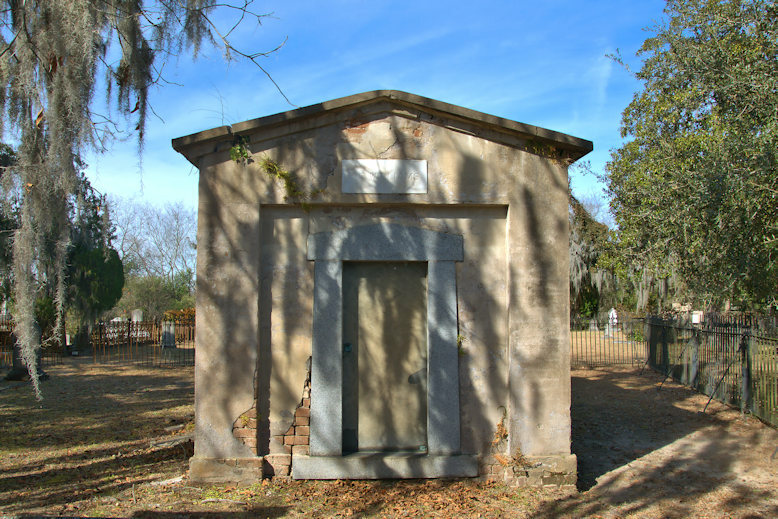 Florence and brother George Martus were the lighthouse keepers on Elba Island in the Savannah River for 35 years. 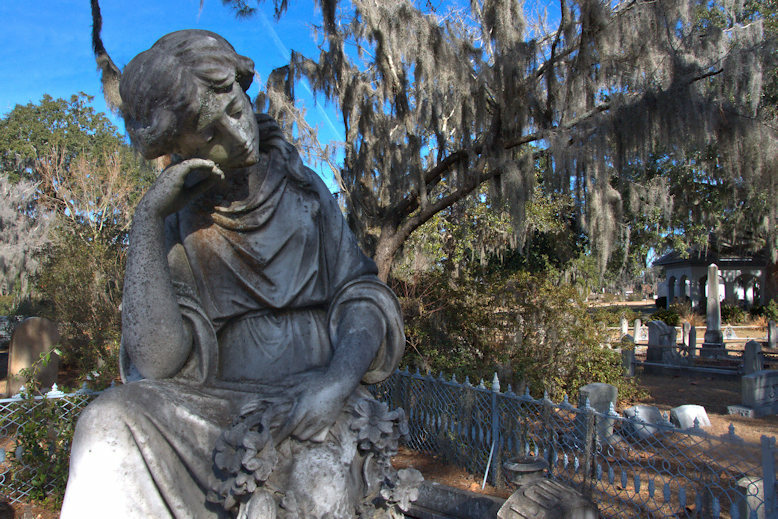 Florence will forever remembered by Savannahians as “The Waving Girl” and has been memorialized by a popular statue on the downtown riverfront. 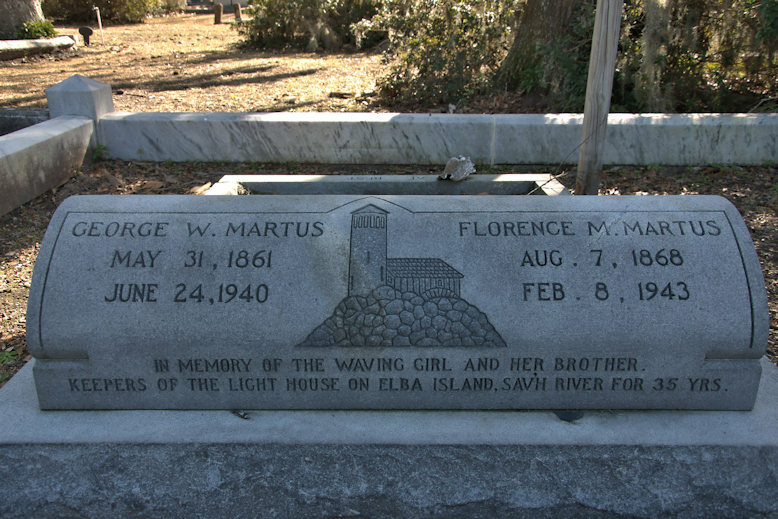 A Georgia Historical Commission marker (at another location) reads: For 44 years, Florence Martus lived on…Elba Island with her brother, the lighthouse keeper, and no ship arrived for Savannah or departed from 1887 to 1931 without her waving a handkerchief by day or a lantern by night. 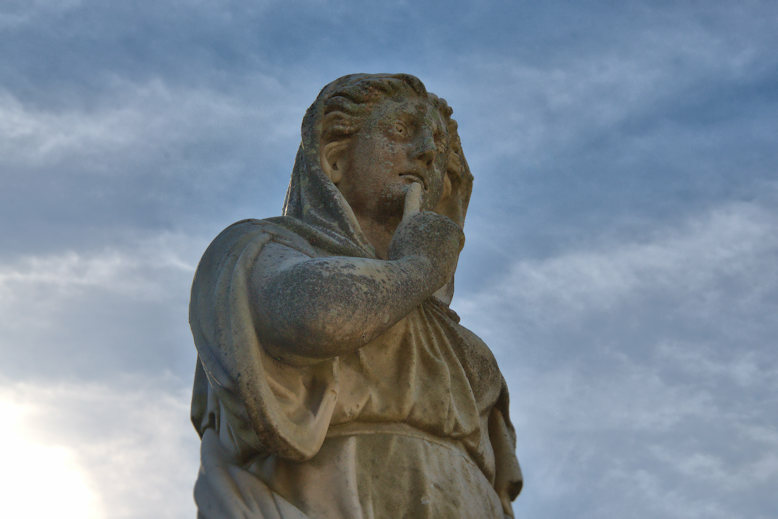 Throughout the years, the vessels in return watched for and saluted this quiet little woman. Few people ever met her yet she became the source of romantic legends when the story of her faithful greetings was told in ports all over the world. After her retirement, the Propeller Club of Savannah, in honor of her seventieth birthday, sponsored a celebration on Cockspur Island. A Liberty ship, built in Savannah in 1943, was named for her. 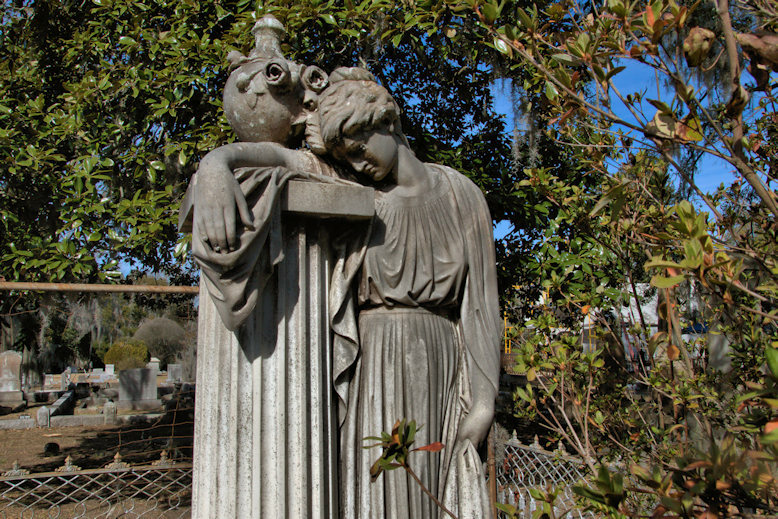 This monument depicting a weeping widow was placed by Emma Getz Heuisler (1857-1938) after the loss of her husband. 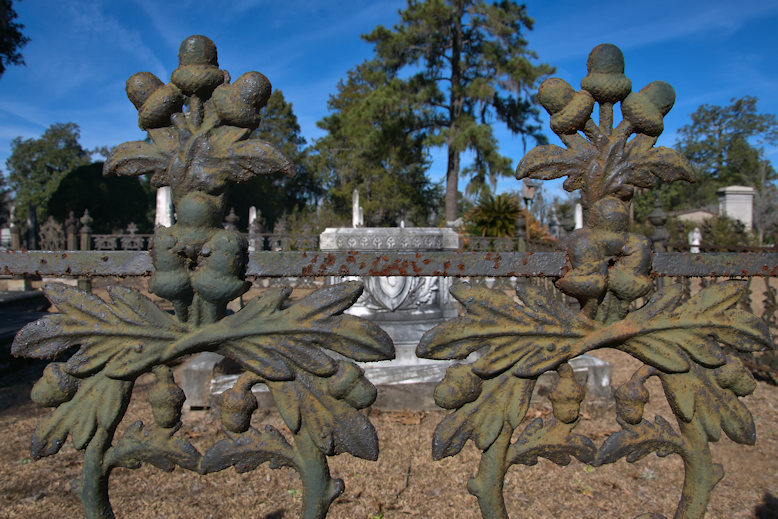 Robert Clifford Fetzer (?-20 February 1920) placed this memorial to honor both of his wives. 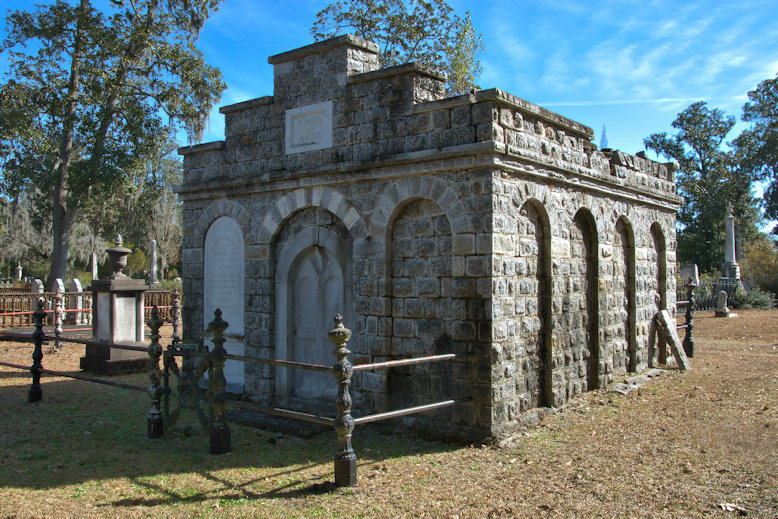 The Jewish section is quite large, reflecting a prosperous community with roots reaching back as far as the founding of Georgia. The Goldring/Woldenberg Institute of Southern Jewish Life notes: By the time of Oglethorpe’s landing, the Jews were already on the way. Apparently, the Jewish community of London seemed just as eager to dispose themselves of their own dependent citizenry, and in 1732 a committee of prominent Jewish Londoners organized a ship to transport their financially strapped brethren across the Atlantic, out of sight and off the community dole. The William and Sarah, chock full of 42 Hebrews, left London the following January, a month before Oglethorpe had even set foot in the New World. 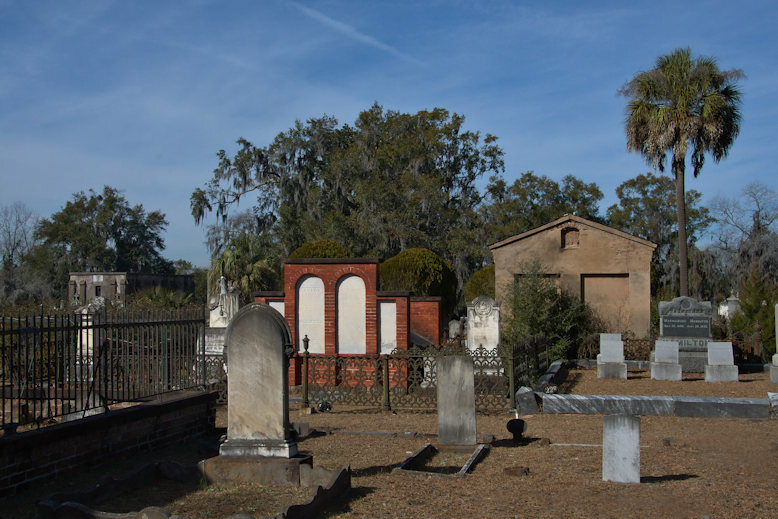 After a perilous journey, the ship finally reached Savannah on July 11, 1733. Upon their disembarking, Savannah instantly became the site of the largest Jewish settlement in the New World. 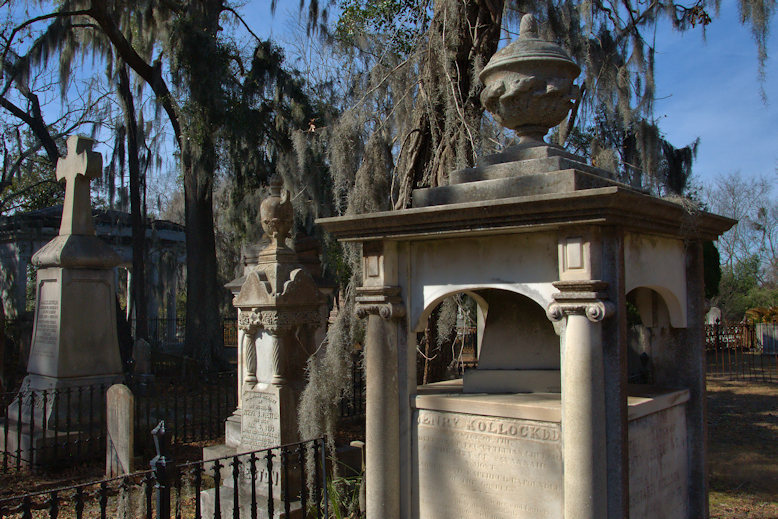 Although the colony’s trustees were unhappy with the appearance of Jews in Savannah, James Oglethorpe welcomed them with equanimity and optimism. He defended his decision by pointing out that the Georgia charter only excluded Catholics and slaves, and made no reference to Jewish settlers. The passengers aboard the William and Sarah were largely of Sephardic descent, with a smaller population of German Jews. The eight German Jews consisted of Benjamin and Perla Sheftall, a man named Jacob Yowel, and the brothers Abraham and Simon Minis and their families. The Sephardic immigrants included Dr. Samuel Nunes Ribiero, a prominent physician who arrived with his family. Dr. Ribiero was not fleeing poverty, but persecution. When the Portuguese Inquisition returned with a vengeance in 1720, Dr. Ribiero and others who secretly preserved their Jewish identity fled the country in large numbers. 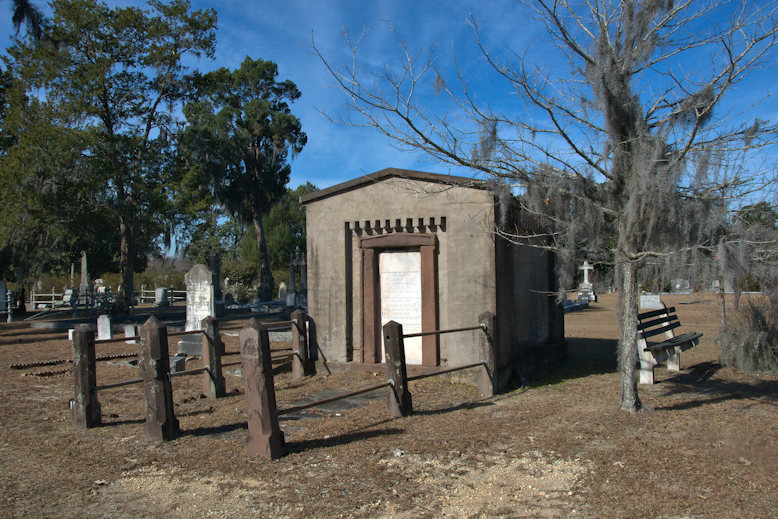 Dr. Ribiero and his family left for London, and from there secured passage to Savannah. 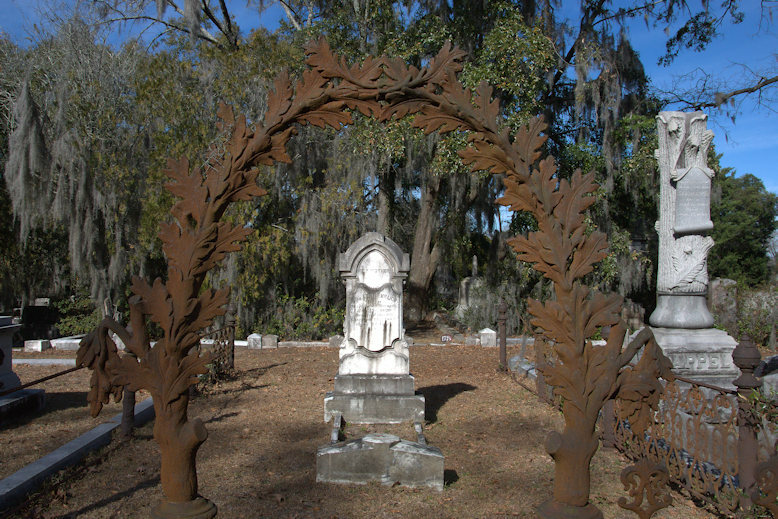 Ornamental ironwork abounds in Laurel Grove. Oaks and acorns are among the most common themes. This section of Laurel Grove contains the remains of over one hundred men who died in battle at Gettysburg in 1863. 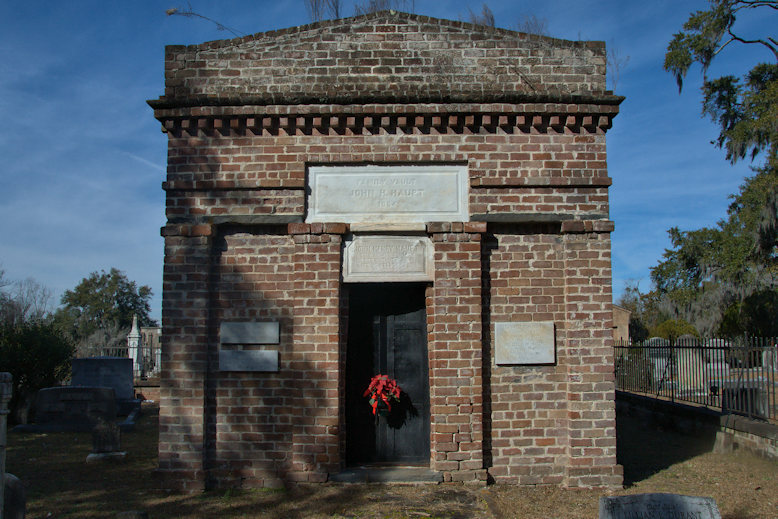 Their bodies were brought to Savannah after a ladies’ memorial society raised money for proper burials. 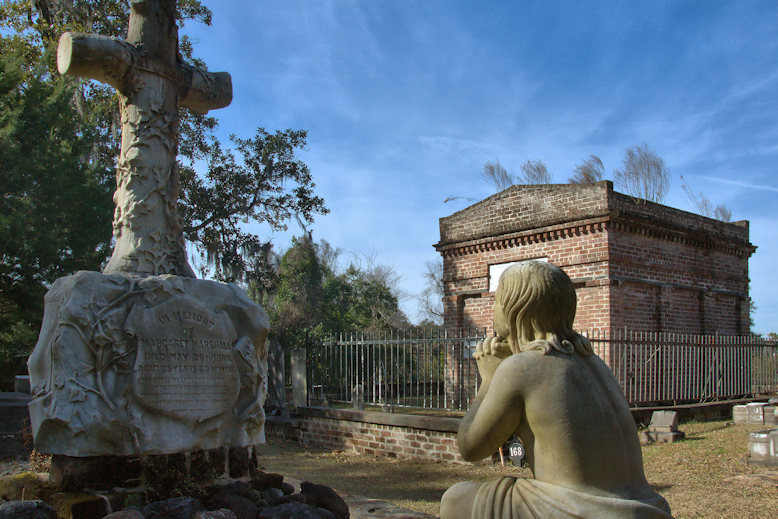 The dead are watched over by “Silence”, a statue originally placed in a gazebo beside the Confederate monument in Forsyth Park, but removed to Laurel Grove to placate ladies who felt she looked as if she were in a cage. 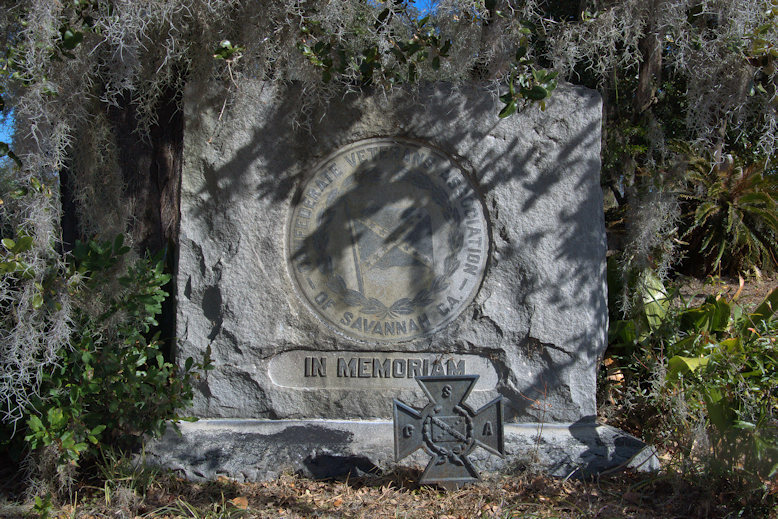 The old Confederate Veterans Association of Savannah likely placed this memorial around the turn of the last century. 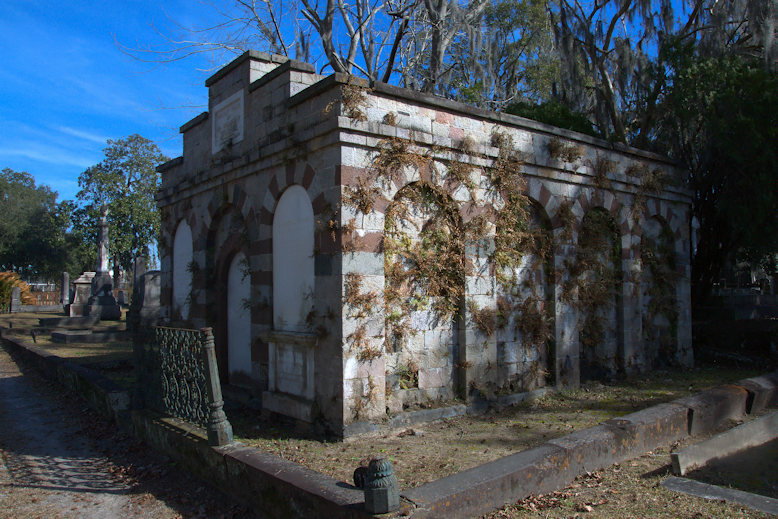 A carronade cannon said to have seen service during the 1864 Siege of Savannah rested here for many years. 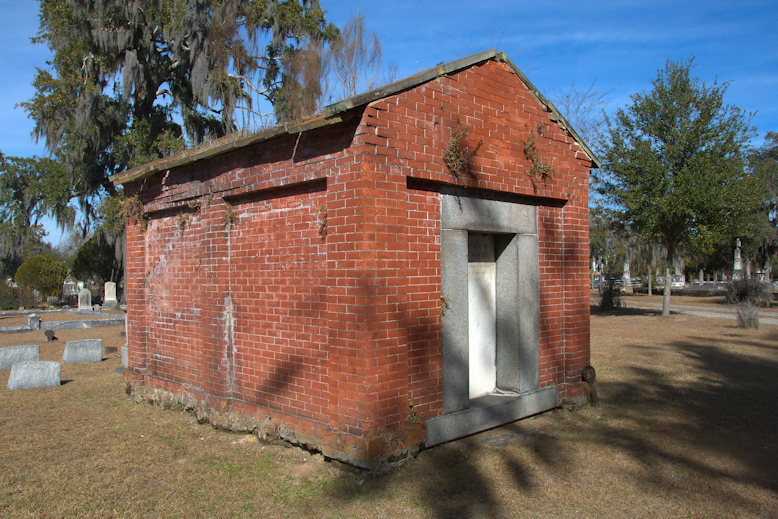 The cannon was removed to Fort Jackson by the United Daughters of the Confederacy in 1990. Dr. Samuel A. T. Lawrence (?-11 October 1860) and family. 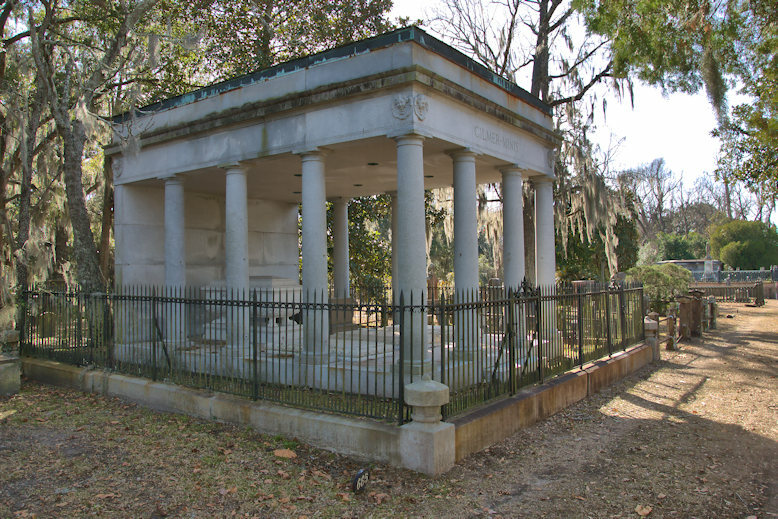 Louisa Gilmer was the wife of Confederate Major General Jeremy Francis Gilmer (1818-1883), Chief of the Confederate Corps of Engineers, and was the sister of Confederate Brigadier General Edward Porter Alexander. 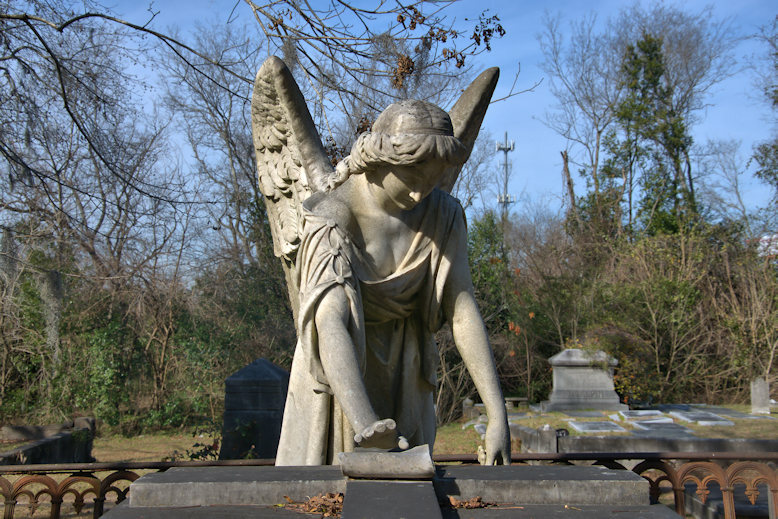 Enduring examples of all manner of Victorian funerary art are found throughout Laurel Grove. Captain Joseph Samuel Claghorn (22 January 1817-8 April 1879) and family. 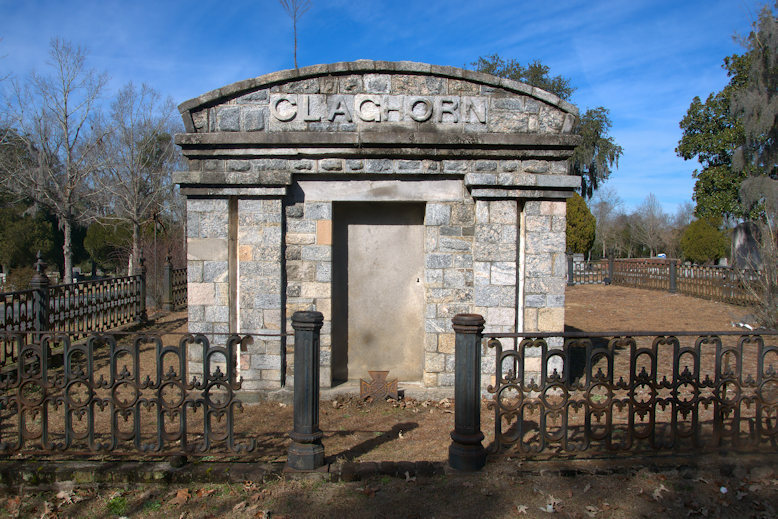 Captain Claghorn was born in Norwich, Connecticut, and came with his family to Savannah in 1827. In 1846 he married Sarah Campbell Hunter. Claghorn was elected Captain of the Chatham Artillery in 1856, a post he held until 1862. Francis Sorrel (4 May 1793-5 May 1870) and family, including Confederate Brigadier General Gilbert Moxley Sorrel (23 February 1838-10 August 1901). Thanks to Bill Harrison, 3rd great nephew of William Wright for the information. 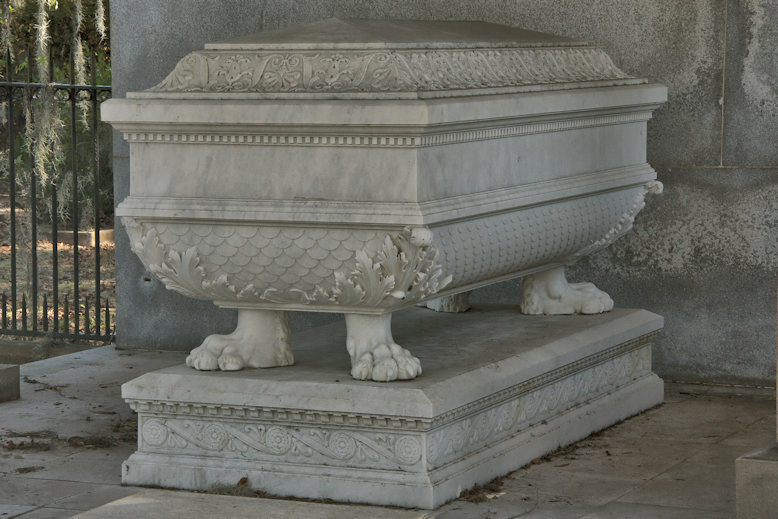 He notes that originally the crypt had a glass door through which my mother viewed his body many time, especially the large gold watch & chain across his midsection; however, grave robbers broke the glass door and looted the graves. The wooden door was the replacement. William Seabrook Lawton (1824-1893) and family. 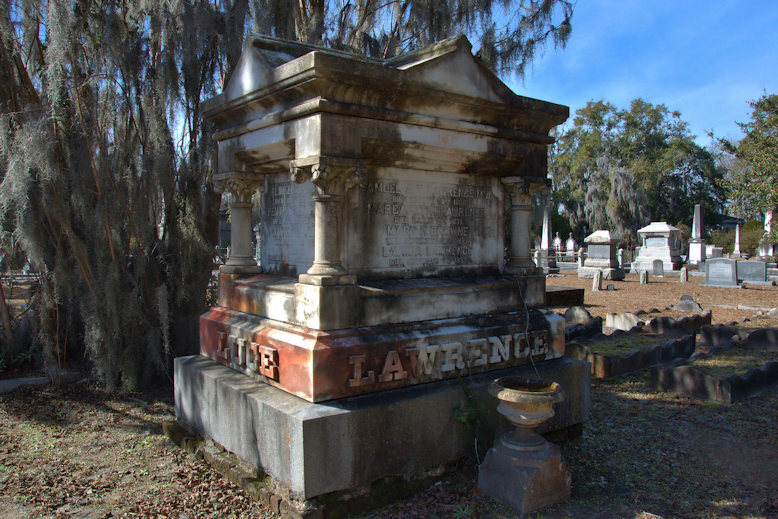 Lawton was the brother of Confederate Brigadier General Alexander Robert Lawton, and Captain Edward Payson Lawton, who died from wounds received at the Battle of Fredericksburg. 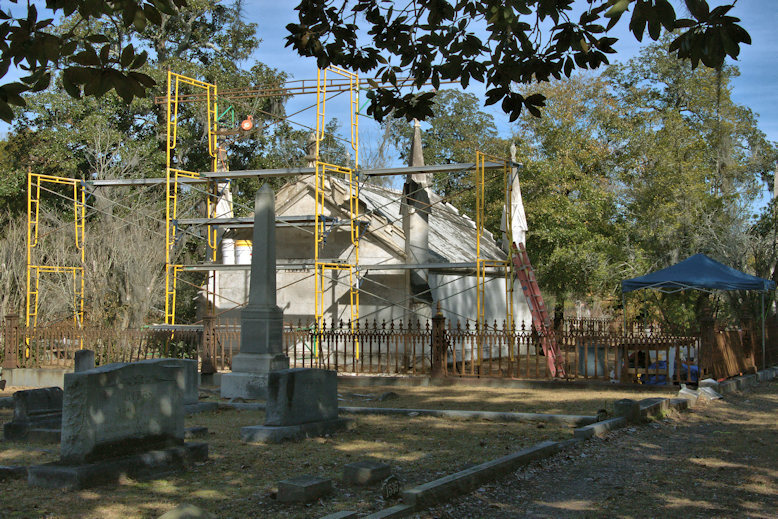 The tall Gothic spires on the Lawton mausoleum are being restored. Richard Farr Williams (1785-1838) and family. Isaac William Morrell (1794-23 January 1865) and family. George Anderson (1767-1847) and family. Dr. William Richard Waring (23 February 1827-26 November 1889) and family. Absolutely stunning! Great pictures with wonderful historical text! Many thanks to you Brian for another wonderful blog on our American history. You perform such an important service. Thank you.